Access to McGraw-Hill's Encyclopedia of Science & Technology and McGraw-Hill’s Dictionary; biographical information, science and technology news and multi-media content. Business periodicals and company profiles. A great starting point: search here for an overview of a business topic with suggested articles and books to read for more information. A good starting point for your research on social science topics (including human services). Start here to find out about a topic and find further articles in books in the bibliography and Recommended Reading sections. A large multidisciplinary database containing 16,000 titles, including scholarly journals, trade magazines, popular publications, and independent reports. Check out specialized encyclopedias, dictionaries, and handbooks in the humanities and social sciences. Free online authoritative dictionary and thesaurus with low-key ads. A free online encyclopedia of philosophy and philosophers. Demographic information about the United States from the Census Bureau. Links to national and international statistics. Official statistical information from numerous US agencies. Have a question? 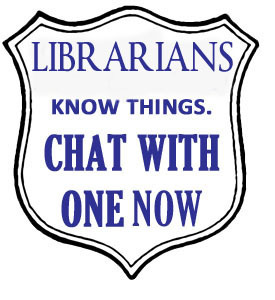 Click here to chat with a Librarian now! Provides reference resources describing opposing sides of today's hot-button issues. Comprehensive tool for locating open-access books, journals, dissertations and other scholarly sources available world wide. Search for scholarly articles in open-access (free) digital journals. Directory of Open Access journals drawing from academic, governmental, commercial and non-profit private sources. A digital library, Hathi Trust aims to digitize and make accessible the books of major research libraries. You can access textual, video, and audio material as well an archive of old websites. Beyond Citation is a pilot research platform that gathers information about academic databases and other digital research collections to enable scholars, librarians, and research enthusiasts to get a better sense of their contents, structure and search mechanisms.